StrongVPN comes highly recommended since the company offers military grade security, friendly, fast support 24 hours a day, every day. StrongVPN started out as a small company in 1994, based in South Lake Tahoe, California that sold computers. Shortly after its launch, the company began offering its fast growing customer base dial-up connections in the local area. With the increased demand for services StrongVPN also provided colocation services as well as dedicated servers and have now expanded its network to more than 660 servers worldwide providing online services to Internet users in twenty-four countries. For over a decade, StrongVPN’s goal remains the same, and the company aims to provide the most secure and honest service to keep users private and safe while browsing the web. Officially Strong VPN launched in 2005 and servers are placed in multiple locations around the globe that include Russia, the US, Thailand, Philippines, and Belarus. The highly trained and passionate team offers assistance 24 hours a day all 365 days of the year and comprises of Windows, Mac, and Linux experts. Strongvpn services include security, virtual firewall, Skype, StrongDNS, Stronger security than a proxy, access to locked websites, public Wi-Fi safety, anonymous surfing of all websites and users can have their IP address from anywhere. StrongVPN adds a new network interface to the Internet connection users are currently working on although all traffic is encrypted and the IP address is different. Both VPN and a Proxy service are able to re-route users Internet traffic while changing IP addresses and the easiest way to think of a proxy is to see it as a filter. Proxy settings that are applied to users Internet browsers such as Firefox proxy, as well as Chrome or Safari, is all proxy servers allowing users to surf the Internet. Unlike proxy servers, VPN or virtual private network replaces users ISP, redirects traffic through a VPN server and encrypts all traffic. Other benefits of using a VPN server includes speed, as well as top security and users, are able to unblock websites while enjoying anonymous browsing. In essence, a VPN is a secure connection to Internet sites that works with all devices, and while no ports should be open, your ISP needs to allow the use of GRE protocol. StrongVPN provides users unlimited access to free, open Internet and no logging records are kept to ensure complete security and privacy. The service includes navigation around locked content as well as censorship on while users enjoy complete privacy all date are secured from hackers even when information is sent via public Wi-Fi. The benefits part of using Strong VPN includes encrypting your Internet connection, protecting all data from cybercrime, masking your IP address and preventing Internet service providers from spying on your activities. StrongDNS offers users the ability to bypass censorships without encryption of software, surf online sites with the fastest possible connection speeds, evade restrictions on any platform including game consoles, mobile or desktop and to browse websites and apps from any location around the globe. StrongVPN offers servers in 46 cities across 24 countries, keeps no logs, support is always available, and all data are protected via 2,048-bit encryption. Automatic setup is part of the service on all Android, iOS, as well as Mac and Windows devices and there, are no bandwidth speed limits or charges. StrongVPN servers offer several benefits over free proxy services, which include the ability to select from geographical locations, remain anonymous, speed and security. 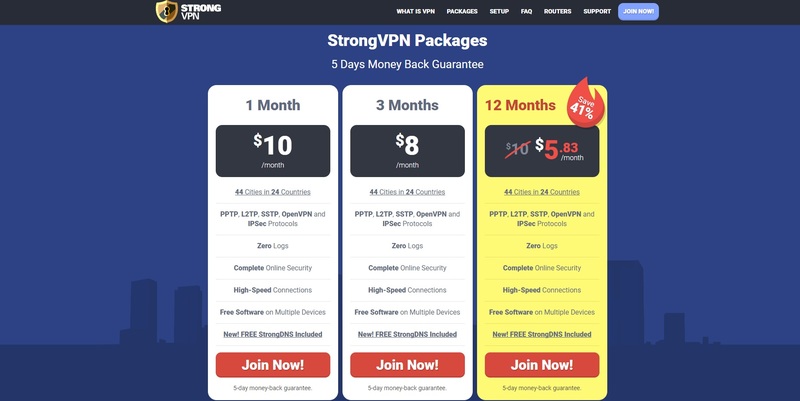 StrongVPN offers three different packages, which includes a one month, three months and one year package. The one month package offers PPTP protocol, OpenVPN, SSTP protocol, IPSec protocol and L2TP protocol, guarantees that zero logs are kept, provide complete online security, provide high-speed connections and now this package also include strong DNS. The one-month package costs $10 per month and offers a 5-day money back guarantee. The three-month package offers a lower monthly cost that works out to $8 per month and provides users access to servers located in 46 cities across 24 countries. By choosing the three-month package free software can be used on multiple devices, free StrongDNS is included, users benefit from high-speed connections, have complete online security, and there are no logs kept ever. The three-month package also includes IPSec protocol, OpenVPN, SSTP protocol, L2TP protocol and PPTP protocols. The 12-month package would normally cost $10 per month and is currently available on a 41% reduced monthly rate of $5.83 while a 5-day money back guarantees are part of the package. The 12-month package also includes complete online security, free software on several devices, access to servers placed in 24 countries and IPSec protocol, SSTP protocol, L2TP protocol, PPTP protocol as well as OpenVPN protocol. All three packages are great options for online browsers who are searching for uncompromised speed, and StrongDNS is perfect for clients who require fast connection speed while top security is available at the same time and 100% anonymity is guaranteed. StrongVPN offers setup guides for IPSEC, OpenVPN, SSTP, L2TP and PPRP protocols and the Windows version is compatible with Vista 7, 8 and ten as well as Windows Vista. The iOS version is compatible with iOS9, and 10 and works on iPad, iTouch and iPhone devices. The Macintosh version is compatible with Sierra, El Capitan, and Yosemite. Lion, Mountain Lion, Snow Leopard and Maverick users are required to download the legacy client offered by StrongVPN. Windows XP tutorials include Windows XP L2TP, Windows XP PPTP VPN set up for PPTP, L2TP, and SSTP protocols, while Open IPSEC and OpenVPN guides include StrongVPN for Windows as well as Windows XP OpenVPN setup tutorials. Windows Vista tutorials include PPTP, SSTP and L2TP protocol setup guides and Windows Vista OpenVPN setup for Open VPN GUI. Windows 10 setup guides include StrongVPN, Windows 10 IKE2 configuration, Windows 10 OpenVPN GUI as well as L2TP, PPTP and SSTP protocol settings. Windows Phone 8.1 L2TP VPN set up guides if available as well as Windows Mobile 6 L2TP, PPTP and OpenVPN setups. Mac OS X and macOS setup guides include Strong VPN client for macOS 10.10/10.12 for PPTP/L2TP and SSTP protocols. Other setup tutorials for Mac OS X also include Mac OS 10.11 – 10.12, macOS 10.6 – 10.12 and macOS 10.5 – 10.12 OpenVPN Tunnelblick. Apart from tutorials for iPad, iPhone, and iTouch devices, users also have access to guidelines for setup of Linux Debain/Ubuntu, Fedora 22 PPTP VPN, Amazon Kindle Fire HD L2TP and Bada 2. Additionally, L2TP, HP web OS PPTP, Chromium OS / Google Chrome OS L2TP VPN and several router setups on DD-WRT routers and TomatoUSB are offered, however Blackberry devices are not currently supported. StrongVPN guarantees that users will not experience any slowness even though encryption does have some effect have to impact on data. Several users have reported that P2P run much faster as StrongVPN since they have the ability to bypass ISP’s throttled. The connection speed test page on the website enables users to check their connection speed. StrongVPN offers over 500 servers located in 40 locations and provides users with the anonymous unfiltered private internet, which includes that traffic to the VPN server is encrypted, users IP changes and that all outbound traffic are encrypted. The difference between several VPN’s is that PPTP world on all operating systems and is amongst the most used VPN connections. L2TP offers the strongest encryption, SSTP works great when other VPN connections are blocked, which include Belize where the use of VPN services are completely forbidden. OpenVPN SSL operates on all systems and allows users to modify encryption levels while it also allows the bypassing of proxies. StrongVPN comes highly recommended since the company offers military grade security, friendly, fast support 24 hours a day, every day. And with over 500 servers globally safety and anonymity are guaranteed while users are on the go. The connection is lightning fast, and users can bypass censorships and restrictions with ease. No logs are kept, and with static and dynamic IP offerings Internet service providers are unable to throttle users connection speeds, and there are no limits to the entertainment users have access to. VPN routers can be ordered from StrongVPN and add security and ultimate privacy to any home, services include a 90-day satisfaction guarantee, sharing of a single Strong VPN connection, Lightning fast download speeds and all devices are protected via encrypting connections. Thousands of fans follow StrongVPN on social media including Google+, Twitter and Facebook and new users can read reviews on the website of over 12,000 satisfied customers that highly recommends the use of StrongVPN.